It’s the first Friday of the month, and that means it’s time for Glossies Made Me Do It: where Ashley and I share what magazines have inspired us to try or share about this month! This month I was inspired by an article in the February 2019 issue of Real Simple. The article was called Find More Alone Time (Without Being Lonely) and after reading it, I knew I wanted to talk about this topic. 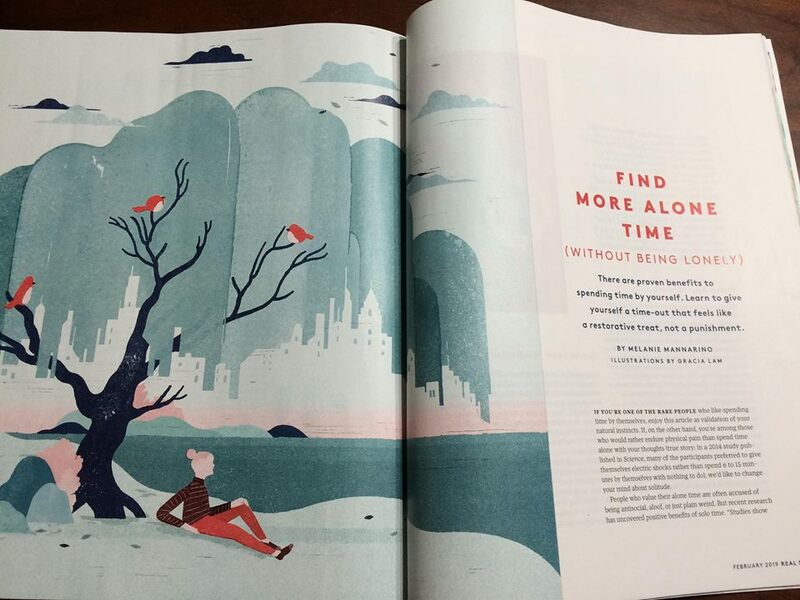 I’m someone who likes their alone time, so this article wasn’t necessarily for me. It’s more for the person who finds it difficult to be on their own, especially if that means they are left alone with their thoughts. And yes, that can be tough, but I liked that the article gave a couple examples of ways that people spend alone time while still being entertained, so to speak. One of the stories was about going to the movies alone, while another was about a mom who went on a mini vacation and stayed in a hotel…all on her own. Both sounded like really relaxing, rejuvenating experiences. After reading, it made me think of the places that I’ve gone on my own that people might feel a bit uncomfortable doing. For example, I’ve been to a play on my own (The Importance of Being Earnest) and I’ve even been to a concert by myself (Fitz and the Tantrums). Both of these were a bit odd at first, but I’m glad that I went and I had fun at both…so why not go alone? It made me realize that I could experience these type of events and be okay on my own. These aren’t necessarily “stuck with your thoughts” alone moments, so they might be easier ways for people to do something on their own without being truly alone. 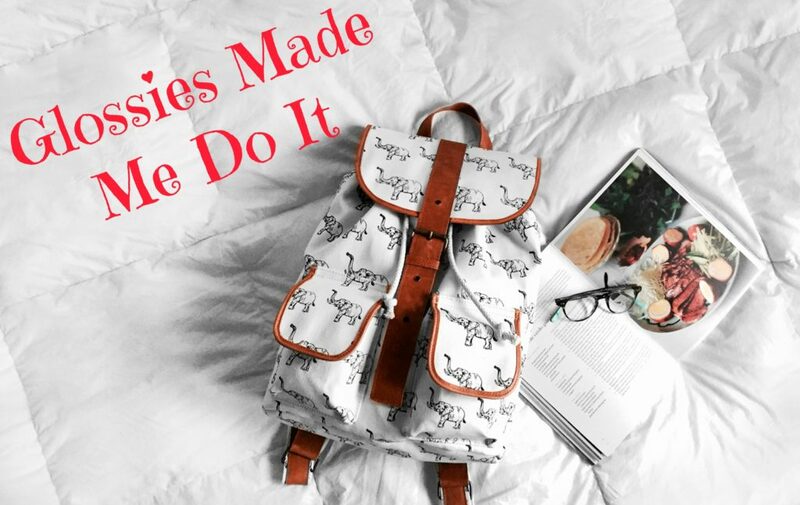 The story about seeing a movie on your own made me think of one of my own goals for my 30×30 bucket list (30 things I want to do before I turn 30) and how going to a movie on my own is on there! This is definitely something I want to check off that list this year. I’m pretty sure that I’d have done this already if I drove, since there are always movies I want to see that nobody else necessarily wants to see with me. However, I can still make this happen. I think it would be relaxing and kind of nice to get lost in a movie without worrying who is with me. So tell me: how do you feel about alone time? What about experiencing things on your own, like seeing a movie, going to a play, or seeing a concert? Would you do these things by yourself? Have your own Glossies Made Me Do It post? Link up with us! I’m with you! I like to be alone but am not always comfortable with it. But I took that candle class last month by myself and it actually turned out pretty great. So I’m hoping to try more things on my own too! I once went to a movie alone, but with my 1 month old baby. It was pretty cool! I should really do that again if there’s something else I want to see. I have traveled alone when visiting people or meeting up with people but I’ve never actually gone on a trip alone. I think I could do it though! Definitely! I have gone to several movies solo. I eat in restaurants solo. I began doing this when I attended University in a new to me city. I had zero friends at first, so it was typical for me to be on my own a lot. My family didn’t live there either so didn’t have that back up. I did meet some great people through those years of studying. I think that’s cool you went to a play on your own. I think we’re more open to meeting new people while out on our own. Great post, Lauren. I love the magazine Real Simple! I crave it and get very little of it, but someday there will be more of it I am sure. I am glad you enjoyed your alone time without being lonely. You went some great places! I was just talking about this with a friend. She is going to a conference in NYC and debating on whether or not to stay overnight. I was trying to convince her to do that and that it would be so relaxing for her, a mom who works full time and has two little ones at home. Personally, I enjoy doing better things by myself and think it’s so neat you went to a concert alone and Fitz and the Tantrums must have been so fun! I have three kids (a 4yo and twins that are 2! ), so my alone time is severely limited. They even follow me into the bathroom when I pee! Hah! (If it’s not them, it’s one of the dogs.) I have to stay up suuuper late to get housework done, and even later than that if I want to squeeze in reading or blogging. It’s not often that I get to do both, and I typically choose reading at that point. I have to do everything alone since my daughter left. I am not a fan of going places by myself. Sam@wlabb recently posted: Discussion: What's In a Name? I actually really enjoy being alone but after awhile I do need some social interactions. But I can handle alone time just fine for like a week at a time. I tend to break it up with dinners with friends and the like. I actually prefer going to movies alone. I love my friends but a lot will talk and that does bother me. As for concerts alone, I’ve done that too. I don’t mind being alone or with someone for concerts. Most of the time I’m lost in the music anyway. Even dining solo doesn’t bother me. I generally bring a book or notebook and do that while enjoying my meal. I’m cool with being alone and don’t really have issues experiencing things by myself. I think loneliness is all a matter of perception. I wasn’t lonely going to the cinema alone but people saw me as lonely and felt bad for me. Just like when I once saw a lady sitting by herself in a restaurant eating a meal and reading a book. At the time, I figured it was sad she had no one to eat with and she must be lonely but with hindsight, I’m betting she was just enjoying a quiet afternoon away from her family enjoying some me time happy as a clam! I’m someone who enjoys time to myself. I usually have a few hours each early morning before starting my day. Things like shopping for groceries or specific things I don’t mind being alone but leisure activities like seeing a film, or just general shopping, I prefer company. Not because I can’t do these things alone but it’s nice to have someone to chat to. It’s also a great way to reconnect to others too. I don’t think people realise how important it is to be able to be alone with your thoughts. Even just every now and again can help settle your soul and forge on. I don’t mind doing things alone. Going to a movie wouldn’t be a big deal, but I do like being able to discuss the experience with someone else afterward, so that is kind of a bummer. If I have my Kindle I don’t mind eating out alone either. Being home alone doesn’t bother me at all since I usually read or I’m on the computer. I run all the time alone, I don’t have a running partner, so there’s that, too. I love my alone time and can never understand those that don’t! I’ve lived alone for over 20 years now, and I’m at the point where I NEED my alone time. My mom had some time off from work last October, and she went to sit and relax in a hotel in Branson, but she came home early. I’m going down to the same area on my spring break, alone, and I can’t wait for the time with no one there. So sometimes I guess others don’t need what we do. I go to the movies by myself a lot, and I eat dinner at all kinds of restaurants these days by myself. I just bring a book. Great post! I love being alone. I have a harder time being around people – especially if there’s a lot of interaction. I do most things with Kevin but I’ll go to a movie or out to eat at times. Or take Fonzi out. Alone time is my favorite way to rejeuvanate! I don’t know that I ever want to take a vacation alone, but I love hiking and shopping alone, and mostly I love to spend time at home alone. I could definitely spend a weekend alone in a hotel or spa! I have to have some daily alone time for my sanity, especially after having tons of interruptions at work and battling a toddler at bedtime! I’ve gone to eat by myself, but I haven’t tried the movies alone yet. That sounds like a good goal! I used to never like going places alone until one time last year, I went to the movies by myself because I couldn’t find anyone who wanted to see a particular film I wanted to see. It turned out to be the most wonderful afternoon I had had in a long time. I need to make a point to do it more often. I REALLY like being alone, too!! But alone in my house more than out and about and alone. I have eaten out alone, done the movie thing alone, attended art classes alone. Most of those things I was okay doing by myself but would have been happier with PC along. 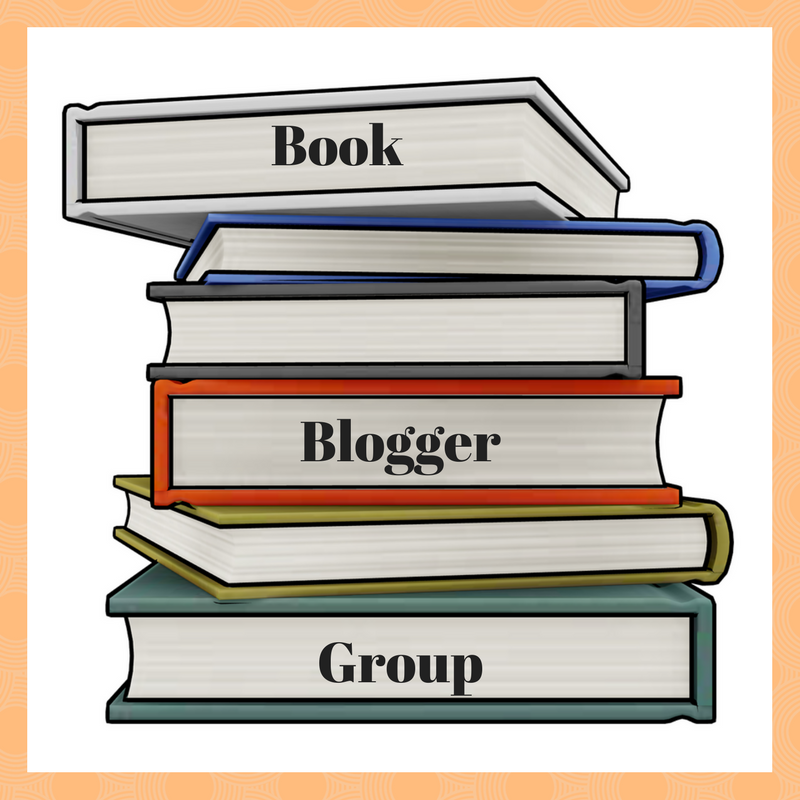 I find it curious that many of us bloggers are actually somewhat loners and introverts. Hope you can find a great movie to enjoy alone. May I suggest The Green Book, if you haven’t seen it? That sounds like a really interesting article! I have a big family and I love my alone time. I have been to the movies by myself a few times and enjoyed it. I think it would be a lot harder for me to eat alone in a nice restaurant. I like my alone time too. And sometimes there is something that you want to do but no one wants to or they’re busy, and it’s a shame to miss out on it for that reason! The older I’ve gotten, the more I’ve realized that I’m really an introvert in a people world. I really really need alone and quiet time in order to do well in my job and in relating to others. When I don’t take enough time for my quiet time, I’m no go for everyone else. I usually don’t feel like I have to do things alone, but I do need some time each week to be able to function well.